Melbourne mother of three opens up about how Whole Body Cryotherapy helped heal her skin from dermatitis. She shares her Cryo Journal, ahead. Some small patches appeared on my upper lip near my nose. I wasn’t sure what it was at first, and being a mother of three and leave little time for myself, I applied some cortisone ointment I had at home. Which seemed to help initially. It seemed to be spreading despite my efforts to control it. I had my first major flare up when I stopped using the cortisone ointment. It broke out on both sides of my nose and on my upper lip, it was red and angry, blistery and sore. I went to see my GP who, at first, thought I had a staph infection. He took some skin swabs and prescribed me an antibiotic. The swabs returned saying no infection and my doctor was perplexed. The antibiotics hadn’t made much difference so he thought to try a different approach and prescribed me and course of oral steroids and a cortisone cream. 3. What hadn’t worked but I had previously tried? I tried some different face products. Before all this started I was using Sukin and was quite happy with the range. After the first small patch of dermatitis appeared I stopped using it. I hunted out a range that might assist with dermatitis and landed on Go-To, which from reading the reviews could help. It didn’t. So, I stopped using face products all together and managed for a short while. Chaos!!! Having three kids, (8, 5 and 2) I was super busy. It was also a crazy time of year, coming up to Christmas. I had all the kids Christmas school and kindergarten functions and preparing our own Christmas gifts. I pushed myself way down the list of priorities. I was self medicating with the prescribed cortisone cream. It wasn’t getting better, and it wasn’t getting worse so I just kept going about life. 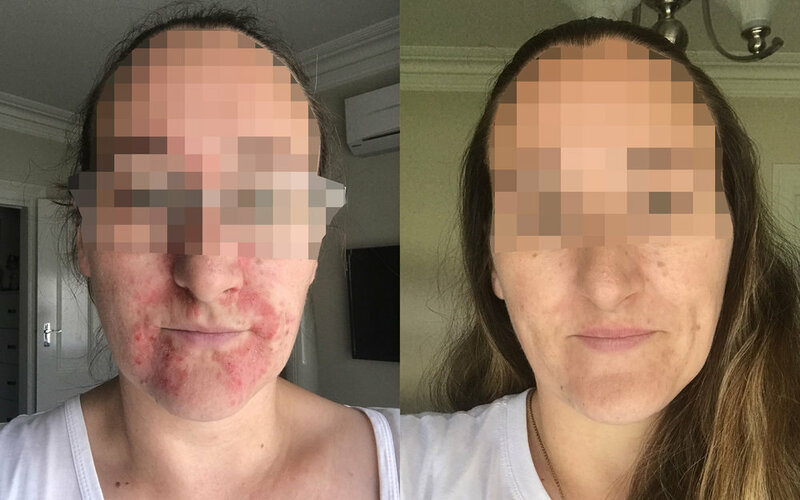 Until the day before Christmas Eve, and I thought it was spreading again, I managed to see a doctor who was sure it was in fact Rosacea and to STOP using the cortisone and start using an antibiotic. As soon as I stopped using the cortisone it was everywhere, it was hot and prickly and red raw. I was miserable, and in a bad way so on Boxing Day, I called the National Home Doctors Service and saw another doctor who put me in contact with a dermatologist. Who wasn’t convince I had Rosacea or Dermatitis. With her assistance I started taking Doxycycline 50mg twice daily and Elidel cream twice daily. 5. Why I decided to try Cryotherapy? I had reached a point where, my face wasn’t my face anymore. I was feeling exhausted and defeated. My mental health was bad. I was open to try anything, so when my girlfriend suggested cryo because it had assisted her with her skin allergy flare ups, I was like, I’ll try it!!! I needed to feel like I was doing something. Awful, my face was red hot and itchy. I was emotional and worn-out. I was also very unaware of what I was going to be doing, so feeling a little nervous. I was also very self-conscious of my appearance and not wanting to be out in public. Great. Being in the cryo chamber is an out of world experience. I felt a weight lifted. I felt relaxed. The cold over my face was instantly cooling on my prickly hot mess. That night I slept better and more deeply than ever. Typically, I’m a very light sleeper I hear everything. The night after my cryo I heard nothing. I woke the next day feeling way more positive and hopeful. The redness and prickliness had gone from my face like magic. I was so pleased with the results. Way more positive about my skin. The benefits of cryo were obvious to me. The inflammation, heat and prickly feeling were all gone. My skin was only improving with each visit. I was experiencing the deepest sleep I have ever had, waking feeling rested and refreshed. Amazing. The double session was intense. The feeling you get after a session is defiantly addictive. Much happier about my skin it was amazing how much it had improved and responded to the treatment. My mental health was something that had noticeable improvement also. I was feeling clearer and more confident. Simple, basically just washing with water. I wasn’t keen on using products due to the severity of the inflammation. My skin was very raw and broken. How immediate they were. I felt a huge reduction in inflammation after my first visit. I woke up the next day with less redness and the prickly itch was gone. The staff were friendly, welcoming and very knowledgeable. I loved my experience and highly recommend cryo to fellow skin condition sufferers.